In addition to the primary file classification results, which are displayed in the top-level view, DiskSorter allows one categorize file classification results by the file extension, size, user name, creation, last modification and last access dates, etc. 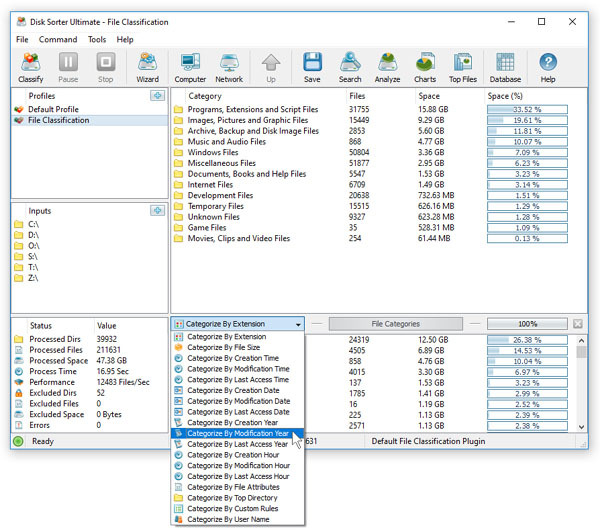 After finishing the file classification process, DiskSorter performs automatic file categorization and fills the bottom view with the list of detected file categories according to the selected file categorization mode. 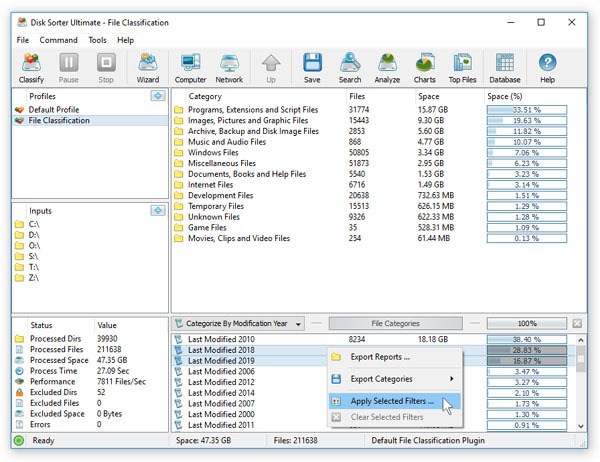 By default, DiskSorter categorizes file classification results by the file extension and shows a list of file extensions sorted by the amount of the used disk space. 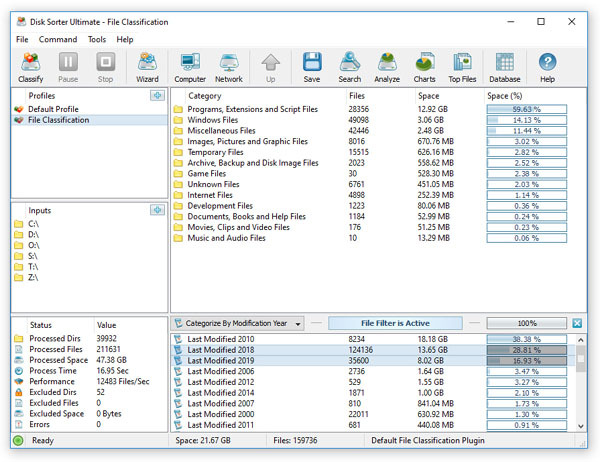 For each category, DiskSorter shows the number of files, the amount of the used disk space and the percentage of the used disk space relative to other file categories. Use the 'Categories' combo box to categorize files by the file size, user name, creation, last modification or last access dates. 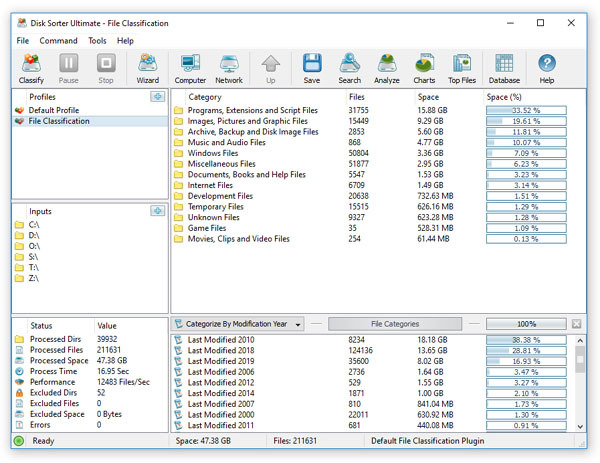 For example, if the file categorization mode is set to 'Categorize Files by Modification Year' the bottom view will display the amount of the used disk space and the number of files per modification year. One of the most powerful features of DiskSorter is the ability to apply second-level file filters to file classification results. For example, in order to see all files that were modified during the last two days, select the 'Categorize By Modification Time' file categorization mode, select files that were modified yesterday and today, press the right mouse button and select the 'Apply Selected Filters' menu item. DiskSorter will filter file classification results and show a hierarchy of files that were modified during the last two days. When a file filter is active, the pie charts dialog will display charts according to the currently selected file filter. Moreover, when a file filter is active, HTML, PDF, Excel CSV and text reports will include file categories and files matching the currently selected file filters allowing one to generate different types of files classification reports showing disk space usage patterns from different points of view.